The Mayor of Affton: The Mayor of Shrewsbury? It recently came to the Mayor's attention that the City of Shrewsbury has submitted a map to the Boundary Commission in February. I was not able to find any news articles about this submission, so it may still be under the public's radar. It appears, on the surface, that Shrewsbury is still interested in annexing a lot of our unincorporated areas farther south than Heege and as far west as our border with Crestwood. My first "freak-out" over this was that on the Boundary Commission's web site, you can enter your zip code to see if any proposals affect you. On entering 63123 I was SHOCKED to find that 63123 was NOT affected! This has since been brought to the attention of Executive Director Courtney Irwin and was quickly fixed. 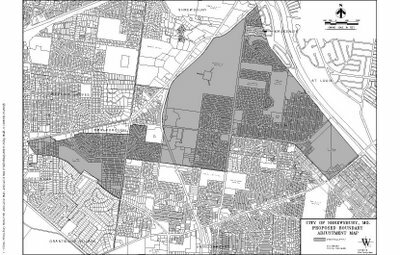 From Ms. Irwin: "Near the end of this summer, the Boundary Commission will hold a series of public hearings wherein Shrewsbury, the Boundary Commissioners, and those constituents potentially affected by the proposed map plan, will have the opportunity to openly discuss Shrewsbury’s map plan. Check our website periodically for public hearing dates, times and locations." I will keep you all posted on those dates. This led me to a conversation by phone with Assistant to the City Adminstrator (of Shrewsbury) John Shaw. He assured me that although Shrewsbury is not really interested in annexing anything within the map just now but they submitted the map to keep their options open for the next five years. Sadly for both sides, there is just not much to tax there. They also cannot annex the whole area shaded on the map as the rules indicate that you can't annex anything more than half your size. One point he wanted to drive home was the fact that he believes that annexation might actually LOWER our taxes. He claims that Shrewsbury residents pay less for fire, police and city services combined than we pay for the Affton Fire District alone. I'll keep you posted. That would be an intersting boundry change. I might also suggest when your power base has developed to a significant point is to mount a hostile takeover of Bayless Schools and merge them with Affton. Then the students of BAyless can finally have a hot lunch since our board and residents 2 years ago voted no to buy new stoves.